Leeks, eggplant, acorn squash – they say variety is the spice of life and can 3 vegetables be more varied than these 3 in one week? And remember if you are tomato’ed and/or pepper’ed out by now, each freeze wonderfully. A big shout out to Larry Leung for filling in as early site supervisor and to Jerry and Joyce Molach and Martha Ma for filling in as early shift volunteers! If you are able to give more than your minimum 4 hours, please do! We still have a lot of shifts needing coverage for the fall. We need site supervisors for the early and later shift tomorrow evening if anyone is able to fill in please let us know. School has started! We are still looking for some high school volunteers for the fall if you know any teens with a service commitment to fill. They’re here! Our new CSA tote bags are always available for sale at pick-ups. The new bags are only $5! ​​NOTE: If you’re not planning to buy a bag, please bring a bag with you to take your veggies (and other products) home. Fruit shares will continue for those that get them. One bag of apples/pears per share. We will have replacement bags of fruit for the members who received damaged/bruised fruit and requested it. We will have a new delivery of assorted small batch S & V Jams this week – $8 / jar. Please remember to sign in! Occasionally a volunteer is distracted and forgets to insist, please try to remember yourself. Signing also reminds everyone exactly what you get which streamlines the process. And please let us know if you can’t pick up your share. We will do our best to work out a plan for an alternate pick up time for you, but even if you are definitely are forfeiting, please just drop a line (email, text, phone call, Facebook message, etc). We cannot hold/save your share for you if we do not hear from you by 7:59 – and yes we do check email and answer the phone all throughout pick-up hours. Acorn Squash – These winter squash are for eating! You can keep them on your counter for about a week as decoration — no longer than that! They are not the storage variety, so they will deteriorate in quality after a little while. Don’t be afraid– they’re pretty easy to cut in half with a large, sharp knife once you remove the stem. They are delicious roasted. Try it! Storage: On the counter. Uses: Cooked. When to use: Within a weekLeeks – Leeks are related to onions, shallots and scallions. They look like large scallions and you can eat all of the white parts and use the green upper stem in stock. 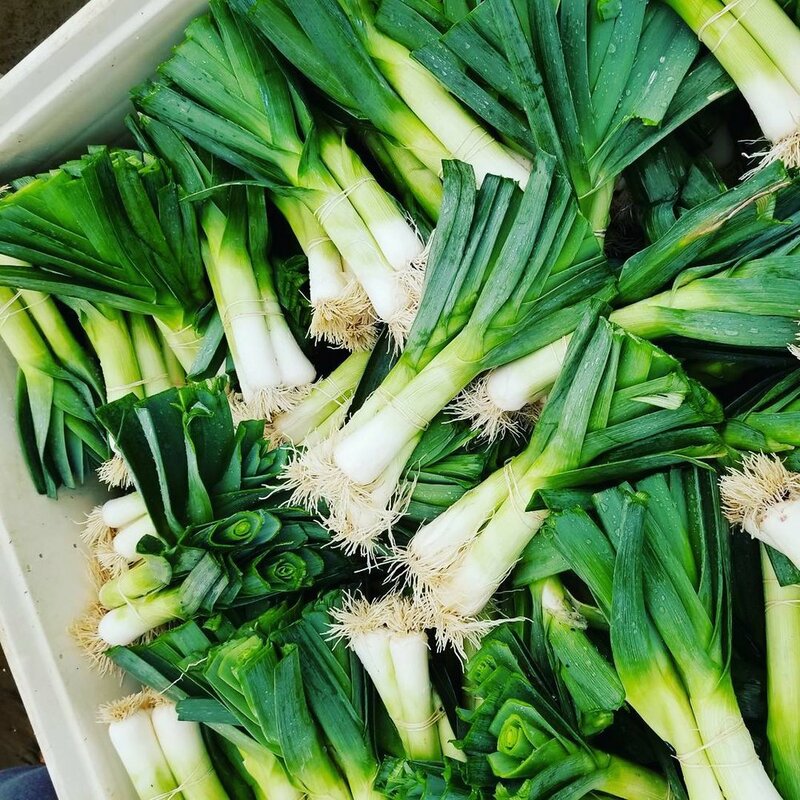 How to prepare leeks — Step-by-step photo tutorial from David Lebovitz. Cherry & Red Tomatoes – The tomato season will be wrapping up in the next few weeks. Until then, we’ll be rotating cherries and beefsteak tomatoes throughout the groups. Romaine Lettuce – This sturdy lettuce will hold its own with chopped veggies and a creamy dressing. Cilantro – So good in fresh salsa, soups, cilantro pesto…I’ve been waiting all summer for this second planting to come in. Green Long Peppers – Wonderful in stir-fries. They also freeze easily. Chop and store in a ziplock bag in your freezer. Eggplant – Item in Rotation! – The eggplant plants don’t produce fast enough to harvest them for everyone on the same week. So we will harvest them as they are ready on the vine and give them out to group by group. Everyone will receive an eggplant by the time the season ends. We keep careful track of who receives what. If you don’t get one this week (and didn’t receive one last week) it’s coming, I promise! Previous Flushing CSA (Week 15)! Next Flushing CSA (Week 17)!